Atman Review 2019: Is Atman a Good Hosting? Atman web hosting services is an important part of Polish industry. They have over 2000 clients and an enormous local data center. Atman is an internet services provider that’s been in operation since 1991. Having worked with the largest and most demanding organizations for over 25 years, Atman has refined their infrastructure and service standards to deliver the most effective customer support even in situations demanding immediate responses. They provide cloud computing and customizable dedicated server packages to their customer base and have three data centers located in Poland. Atman provides primarily cloud computing services and dedicated servers to enterprise-grade clients. Given the level of service they’re operating at, they’re not as suited to individuals and small businesses looking to establish a basic online presence. They do have startup options available for their dedicated servers, but these are still premium options for businesses that already have a sizable amount of traffic and require more room to grow. 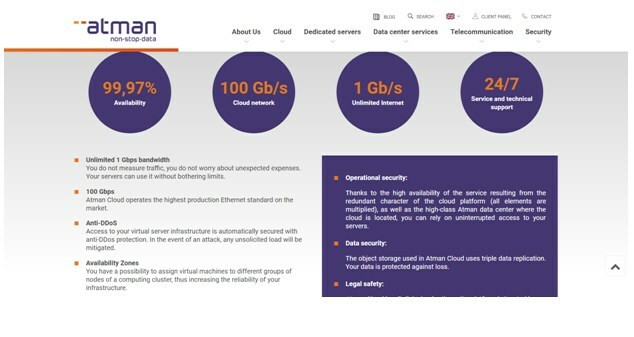 Atman has an impressive 99.97% uptime rate for their cloud computing services. Their dedicated server offerings do not have an uptime guarantee, as these are solely self-managed. However, they do have a power supply guarantee at 99.999%, 24/7 on-site tech support, and hardware repair/replacement services within four hours throughout the entire contract. As one of the largest data center management companies in Poland, Atman is well able to deliver on state-of-the-art infrastructure. They have a total of 13,600 square meters floor room dedicated to servers, all with fully-redundant peripheral systems, anti-DDoS standard protection protocol, 24/7 on-site support, advanced security and intrusion detection systems, and of course, security staff monitoring the premises around the clock. Plus, not many companies can brag that they have their own exchange points connected by lines: Atman has over 10,000 kilometers of lines connected to multiple international hubs. This brings even more reliability and quality to the table. Atman also provides a huge amount of choice in server types to accommodate clients’ needs accordingly. With three data centers located in Poland, Atman provides their customers with flexibility and room for potential growth like no other company. When the customers demand growth, Atman will be ready to supply with brand new and diverse technologies. Providing such a high quality and support-intensive service and maintaining so much hardware doesn’t come cheap, so it should come as no surprise that Atman is little on the pricey side. This is normal given the enterprise-grade solutions they provide. That said, they do have a huge range of dedicated server offerings, spanning startups looking for an affordably-priced solution to large corporations looking for a fully-decked-out package. Prices vary from client to client and are based on their needs, so do not be alarmed when you see their prices. In short, with Atman, you get what you pay for. Atman provides 24/7 on-site tech support through their team of highly-qualified system administrators, monitors, and security staff. Do note that their dedicated servers are unmanaged options, so you’ll need to hire competent server management personnel or engage a dedicated server management company to maintain your servers. That said, should you run into any hardware or network issues, Atman’s SLA promises 24/7 support all year round. On a global scale, Atman is not amongst the leading dedicated server providers; however, in Poland, they definitely are. Why people choose to work with Atman is no mystery: they’ll have dedicated, highly-qualified engineers and programmers working for their satisfaction. Wondering how Atman stacks up against other Web Hosting companies? Enter any other Web Hosting company and we will give you a side-by-side comparison.